Another great presentation from our “resident pro”. A philosophical Les drew out more comments and discussion from the audience than usual though he insisted we had put something in the tea. We are predominantly bowl turners he asserted, based on his own observations and sales of bowl blanks which far outweigh square section. There was not too much argument from the spindle turners as Les moved on to his bowl turning demo. The long grind bowl gouge is worth mastering for its versatility. Its main advantage is the pull cut which removes material at a fast rate. It can also be used to push and this will usually give a better finishing cut. The long ground edges can also be used to scrape. All without having to pick up a different tool. The long grind doesn’t work on a small gouge (say ¼”) though as the flute can’t handle it. There is also a need for a much straighter grind, say 60o for the bottom of bowls when hollowing. 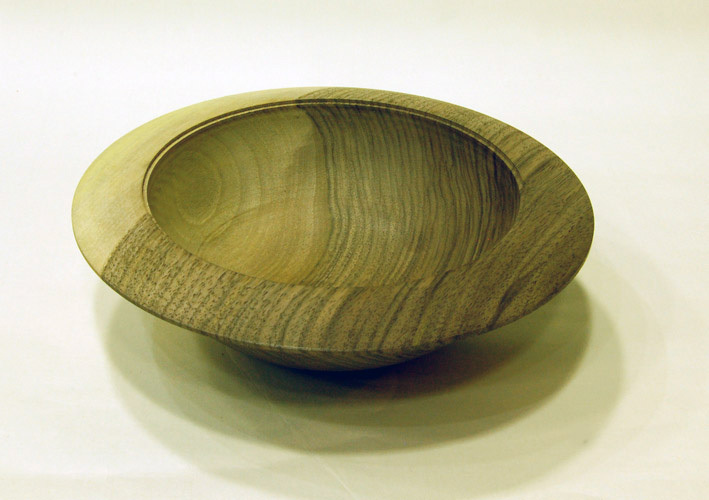 The first demo was a walnut bowl which Les mounted on a screw chuck to turn the outside. He always uses a spigot for the scroll chuck to hold for turning the inside not forgetting to mark the centre of the spigot for alignment later. This gives a secure grip without intruding into the bottom thickness as a dovetail would. There was a lot of discussion about this but no convincing argument to the contrary apart from the use of expansion to hold something with a hole through it or in the base. Les always re-reverses finished bowls to clean up the base anyway, often retaining the spigot as a foot. Even then it is desirable to clean it up as the chuck will probably have left its mark. 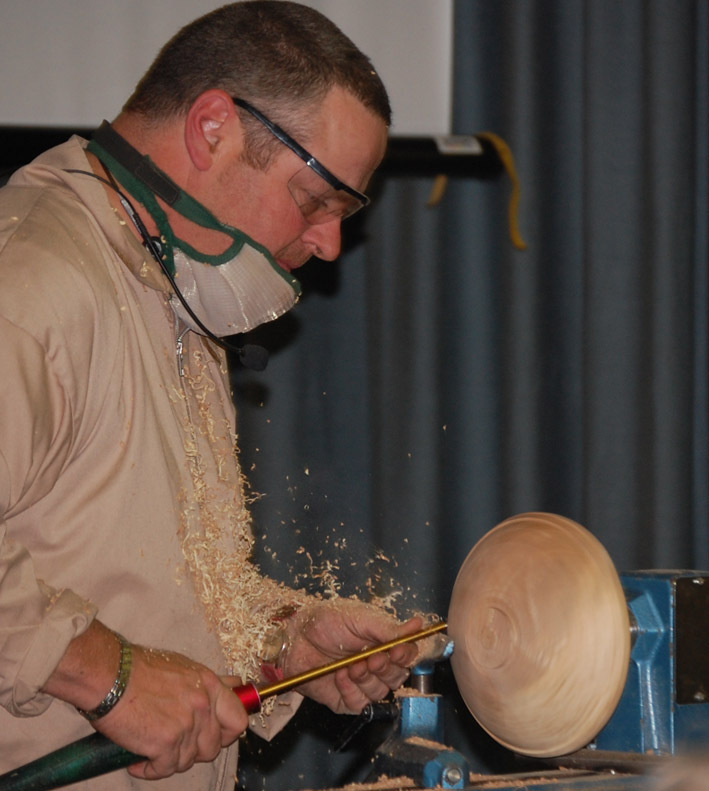 When hollowing a bowl, Les doesn’t drill a centre hole. The only time he would do that is for a hollow form. Some find it easier to start with the bevel rubbing on the surface and then move the handle out to direct the gouge into the wood. The alternative is to attack with the bevel in line with the cut direction but this can be prone to kick back as there’s no support. Of course you have to do it that way for natural edges where there’s no even surface on which to rub the bevel. 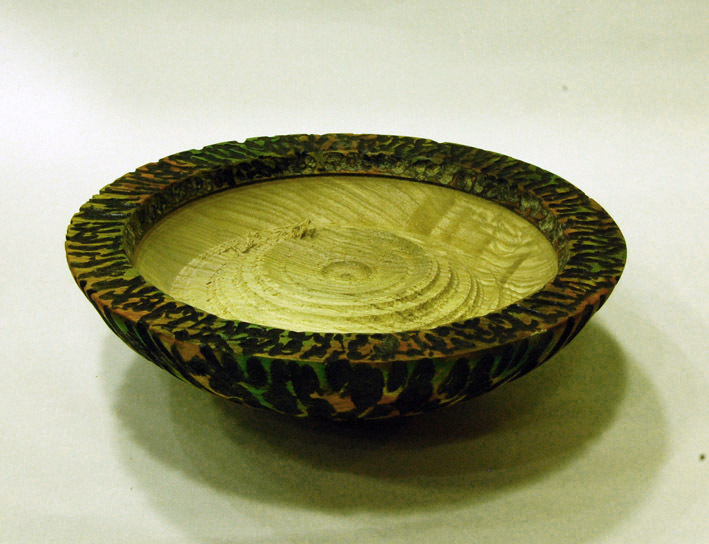 Les hollows the bowl with push cuts in sections which he blends together rather than sweeping all the way round. The reason is that this involves less repositioning of the gouge on the rest during the cut, giving a smoother finish from the tool. Repeated cuts over the same area are quicker too and the bevel can be kept rubbing during the run back for the next cut. You know the gouge is working properly when the shavings exit via the flute. Les prefers to keep the rest outside the bowl even though the tool overhang is greater. Again, it is easier to follow the curve by sweeping the handle with the rest in this position. If the overhang becomes a problem he switches to a larger, stiffer gouge, probably finishing the centre with a steeper ground gouge presented straighter on to the wood. He aims to achieve a sufficiently good finish from the gouge not to use a scraper. This is his way rather than an elitist attitude. He acknowledges that shaping is easier with a scraper and many turners get very good results with scrapers. Les reverses his bowls onto a vacuum chuck to finish the foot. Of course few amateur turners can justify the expense and it is practical to reverse onto a pad with the tailstock keeping pressure on the spigot centre, as he demonstrated since he had no power for the vacuum chuck! He didn’t sand the bowl for lack of dust extraction. 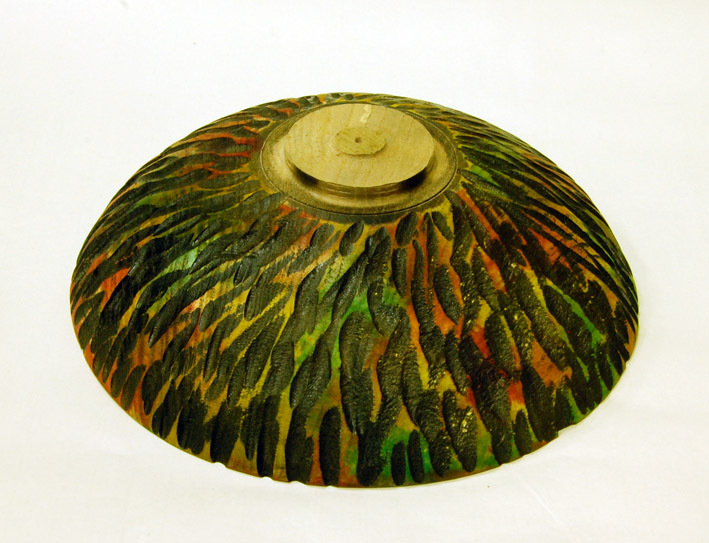 After tea Les turned an ash bowl by a similar procedure and then went on to texture and colour it. The outside was randomly textured with a mini Arbortec held in one hand whilst advancing the bowl with the other. (Don’t use a full size Arbortec cutter unless you’ve got hands as strong as Stuart Mortimer’s!) 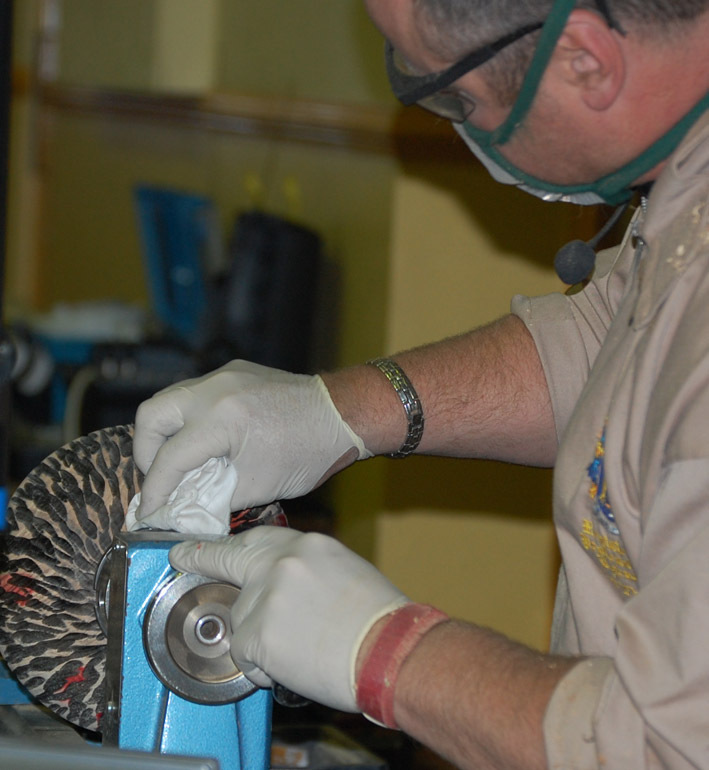 He cleaned up with a rotating sanding brush (available from the Tool Post). Having reversed the bowl he turned the rim and part hollowed it. The rim was textured with a rotating burr called a “decorating elf” in a Proxon tool. (Geoff has some elfs (elves?) in the shop.) Between the rim and the bowl, Les cut a stopping groove which would fill with ebonising lacquer to prevent the stain bleeding into the bowl. So the bowl was sprayed with the lacquer outside and on the rim and groove and sanded back to leave the high areas unpainted. He then applied various colours of spirit lacquer with a cloth. This could have been be sprayed on but a brush is not suitable as it is difficult to control the amount of stain. Yellow stain overall blends the colours nicely and the bowl is then sealed with sanding sealer before finishing with clear acrylic lacquer. That just leaves the inside to be hollowed, carefully removing half the stopping groove. Les still had sufficient energy to do a quick critique on the gallery. All the items can be seen on the website. It is nice to see a number of relative newcomers putting work on the table and improving by learning from the constructive comments.